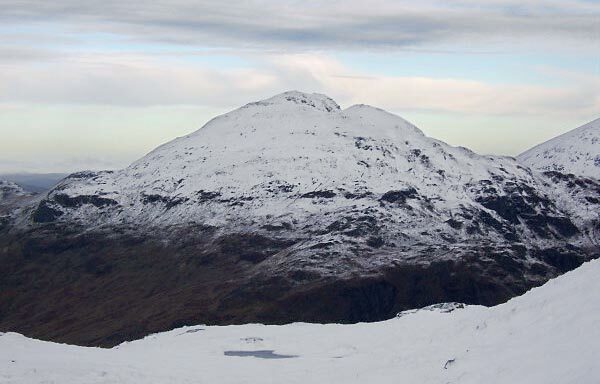 Cruach Ardrain is a very craggy "Y" shaped mountain with two parallel long ridges running NW towards Crianlarich either of which can be used for access. The more W of the two NW ridges is the normal access route from the track in Coire Earb to Grey Height (685m) then SE to ascend the W face of the mountain, or more usually onto the SW ridge for an easier ascent. It is not recommended that you approach Coire Ardain through commercial pine forest to the MW as this takes you onto very muddy paths. The more E of the NW ridges can be accessed from the path in Benmore Glen to the E, however, this route is very steep in places and not recommended. 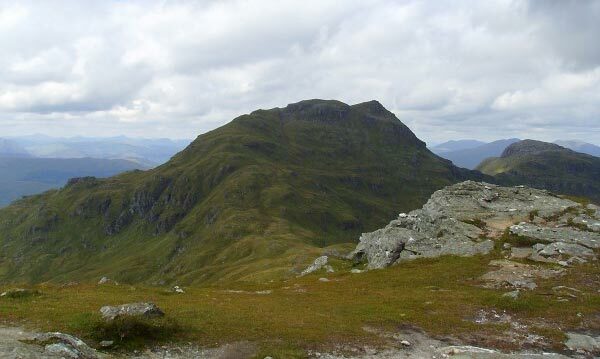 A third ridge runs SE to Beinn Tuliachean with a spur SW to the very craggy Stob Glas (815m). Cruach Ardrain from Beinn a' Chroin. Small Lochain on the way up to the summit of Cruach Ardrain. 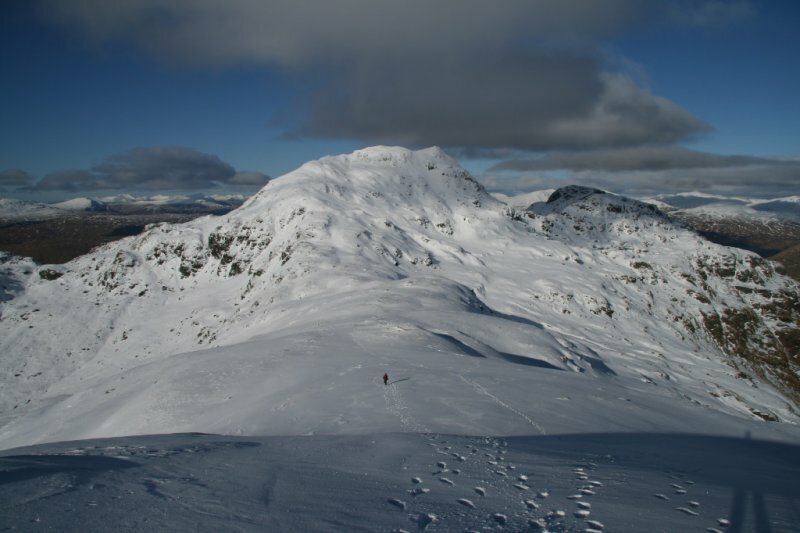 The summary information of one or more ascent routes that include Cruach Ardrain. 1 1480 m 15.82 km 6 hrs Cruach Ardrain and Beinn Tulaichean A moderate route with some steep slopes and crossing an unbridged stream (easier in dryer weather). 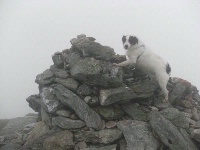 Billy in the mist at the top of Cruach Ardrain. 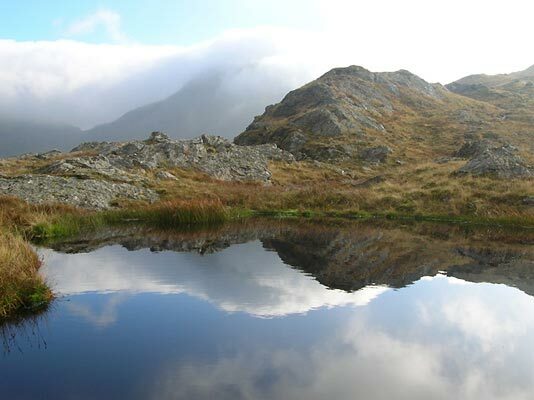 Post a few words about Cruach Ardrain or read what others have had to say. Showing the most recent 5 of 13 comments. Would you like to view all 13? Climbed with my son from Car Park on A82 in around 5.5 hrs round trip. Stuck to the Munromagic route reaching Cruach Adrain in around 2 hrs 15 mins and then onto Beinn Tulaichean which was fairly easy before returning by same route. Crossed the rickety bridge and up the boggy path next to the fence at the edge of the cut-down forest to reach the ridge. The walk along the ridge is fairly easy although up and down a bit before a steep climb to join the path which connects Cruach Ardrain and Beinn Tulaichean marked by a very small cairn. Weather poor with wind, rain and low cloud. GPS was useful. 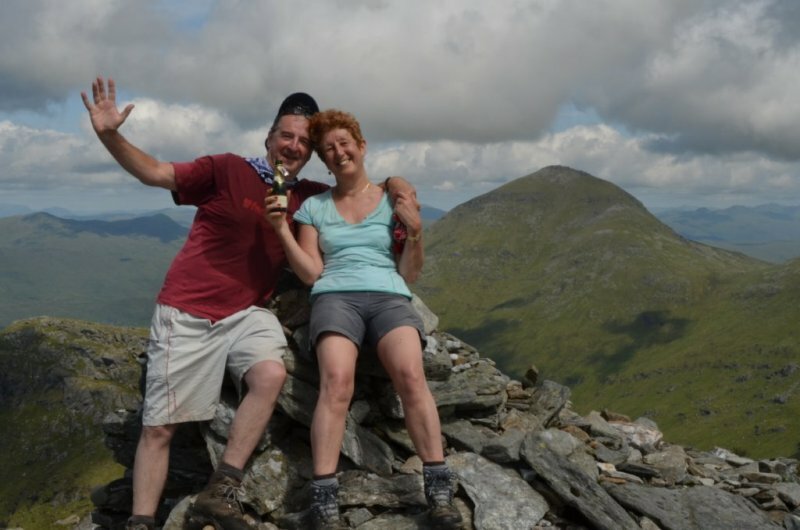 Instead of starting from the A82 car park by the River Falloch, an ascent to Grey Height can be made directly from Crianlarich, by starting from the park by the Youth Hostel. A path can be followed out of Crianlarich, where following signs will take you onto the forestry tracks. Following the track upwards - take a right, a left then a cairn will mark a turn off point on the right. A rough path can be followed onto Grey Height. I've used this path several times now and is practical if using the trains. Others seem to be ascending this way as well given the numbers I've seen on it. 13/06/09 - Climbed solo from Keilator Farm railway underpass. Skirted forest using track then crossed river via a very 'rustic' bridge. Steep climb to Grey Height almost killed me but was probably down to hangover & lack of breeze. Onwards to Meall Dhamh where I met chap from Strathaven Climbing Club who accompanied me to Cruach Ardrain. 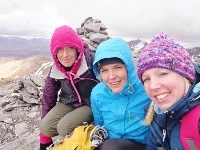 Thunder cleared us from summit before we could admire Ben More & Stob Binnein for too long. Continued solo to Beinn Tulaichean where I began to fade on the return leg as a result of the pain from the massive shin blisters I had developed wearing my new boots. Climbed 2008-09-07 with Ben More, Stob Binnein and Tulaichean - made for a long day out. 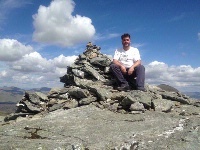 Approaching the summit from Stob Garbh was problematic, to an extent. This side is incredibly steep and although the path runs straight up the rather daunting looking face without many problems, a few moments had me pausing for inspiration. That was, with some pretty huge and steep drops behind. Unless you are comfortable with such exposed moves, it's probably easier to traverse around to the southern slopes and climb up from there. Otherwise, the ridge to Tulaichean was superbly simple - a nice walk. Climbed with Ben Tulaichen in cloud with occasional welcome sunny breaks. Basically followed the "Munro Magic" route which sensibly avoids the start through the forest. Varied the route by heading directly ESE for top of Cruach Ardain from approx NN40102150 (shorly after descent and reascent following Meal Damph) the path is less well used than the "bypass" route but is safe and clear, this avoids back tracking between waypoints 6 and 7 on Munro Magic route.